Six-time Match Racing World Champion Ian Williams, GAC Pindar crashed out of the 2016 Congressional Cup, stage two of the World Match Racing Tour after finishing 12th and last in Qualifying. Exiting the regatta alongside Williams were Johnie Berntsson (SWE), Keith Swinton (AUS) and Sally Barkow (USA). Despite three days of rain, light air, shifting breeze, drizzle, gusts, cross currents, and a drenching fog, LBYC PRO Randy Smith and his Race Committee pulled off 66 matches, to complete Qualifying. The international field of racers willingly obliged, saying, “that’s sailing,” as the weird and wet weather system overtook Southern California. But there was breeze. Wafting, light, but steady; from the south, but enough to complete the round. In the end, Phil Robertson (NZL) with 10 points, maintained a solid lead, followed by Chris Steele (NZL), Nicolai Sehested (DEN) and defending champion Taylor Canfield (ISV) at eight points each: all of whom automatically moved into the Quarter Finals, alongside Bjorn Hansen (SWE) and Sam Gilmour (AUS). Initially repêchage racing was underway in the Congressional Cup Stadium, to determine the final two Quarter Finalists. ‘Repêchage’ is from the French term ‘second chance’ – a round that gives the defeated teams a last-ditch opportunity to qualify for the Quarter Finals. But as winds dwindled, PRO Smith was concerned that with further disruptive weather forecast, continuation of the repêchage would jeopardise the Quarter Finals and Semi Finals. He and WMRT Racing Director Craig Mitchell decided to terminate the repechage. Meanwhile Eric Monnin (SUI) and Scott Dickson (USA) received last-minute salvation; and go on to the Quarter Finals. Frontrunner Robertson admitted today’s racing embraced “the most hectic pre-start ever, with four hoists and 10 circles,” against Hansen. He will race against Gilmour; while Dickson will be paired with Steele; who confessed to a “very tough day” adding, “we’re surprised to still be sitting in second place.” Sehested will be matched with Hansen, and Canfield vs. Monnin, in Saturday’s opening matches. 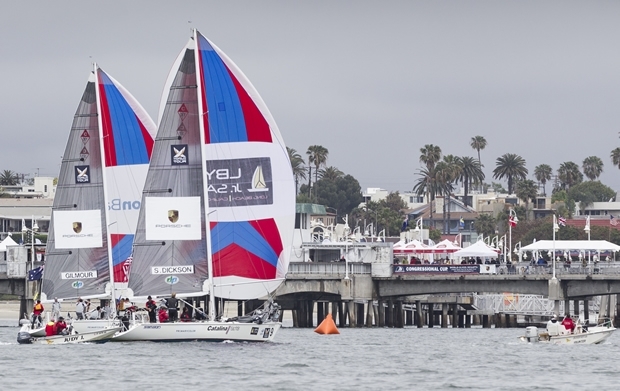 Congressional Cup racing continues through Sunday in the waters adjacent to the Belmont Veterans Memorial Pier in Long Beach, beginning at 1130 daily.